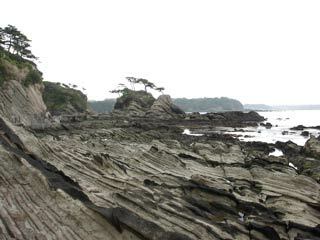 Cape Ara (荒崎) is one of 50 views of Kanagawa located in west side of Yokosuka. Cape Ara literary means a rough cape. It has very unique view with white rocks and pine trees. When the air is clear, you can view Mt. Fuji and Enoshima at the same time. There is a walking path for easy hiking at the rough rock beach. This spots is also called Moutain Castle because there was the castle of Miura clan. After the fall of Miura Clan in 1247, Sawara clan used this castle until the end of Edo Period. There are three small hills which you can enjoy family activities. Also, great spots for fishing.